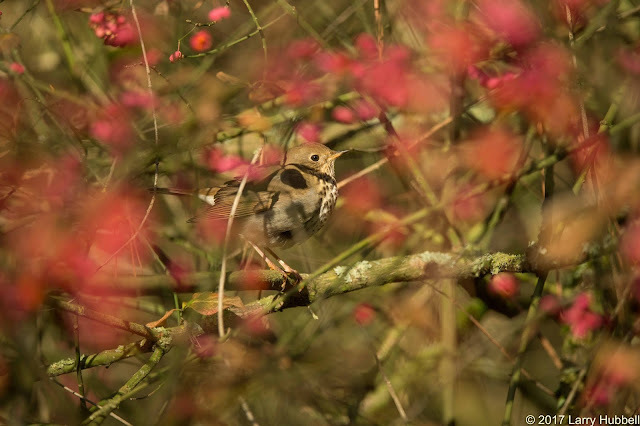 Spotting a bird in a tree filled with colorful fruit is always a treat. 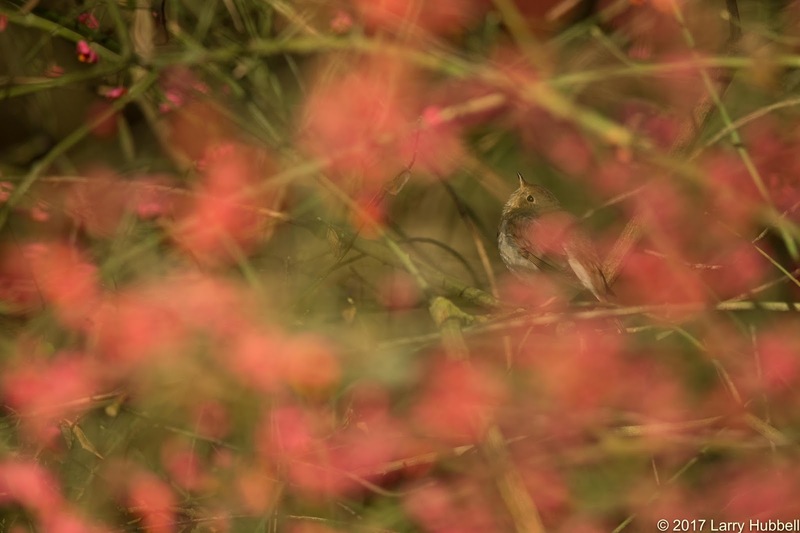 In the winter, when many species have gone south and most branches are bare, seeing a Hermit Thrush surrounded in purples and pinks is especially satisfying. In this case it was not a complete surprise. Just a week ago, I photographed a Hermit Thrush in this same little tree. Like us birds can be creatures of habit. They often return to their favorite places, especially when the food is good. Unlike the vegans, in last week's post, Hermit Thrush tend to eat insects during breeding season and focus more on fruit when the weather gets cold. Although, I suspect that fruit is their second choice. 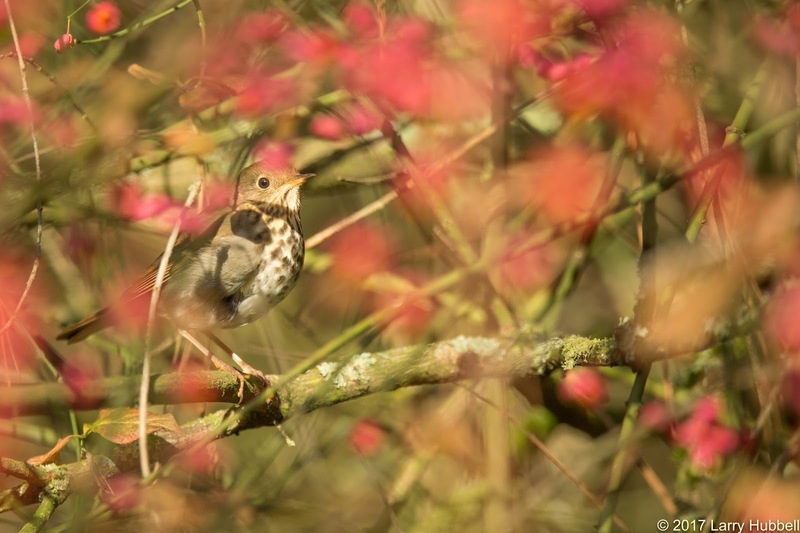 This bird could have been eating the fruit of the Spindle Tree, but it was hard to be sure. I could see the bird searching overhead. I could see the flurry of its wings as it leaped up among the branches. Its behavior reminded me of a Golden-crowned Kinglet nabbing insects from under the lacy branches of a Western Hemlock. However, I simply could not see through the foliage of the Spindle Tree to determine what the bird was eating. Thirty minutes earlier, I was lucky enough to actually see a Hermit Thrush consuming fruit in a nearby tree with a little less density. I suspect it may have been the same bird. 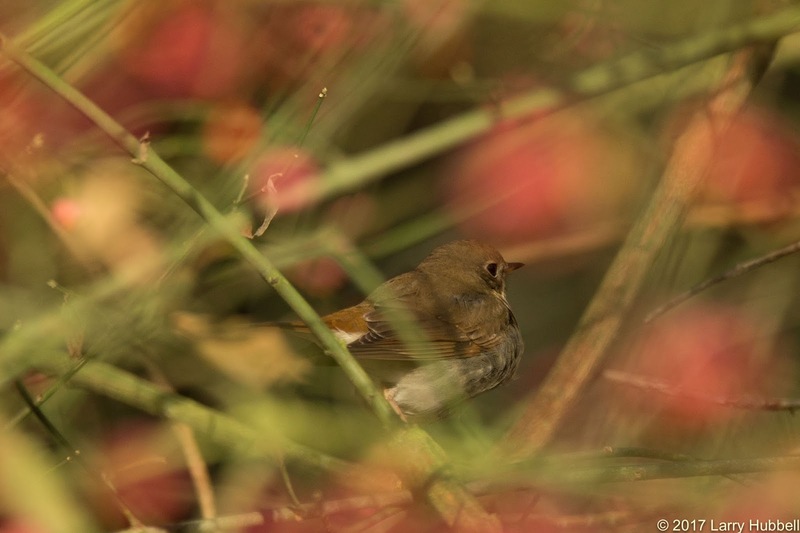 Hermit Thrush tend to breed high in the mountains and winter in warmer places. 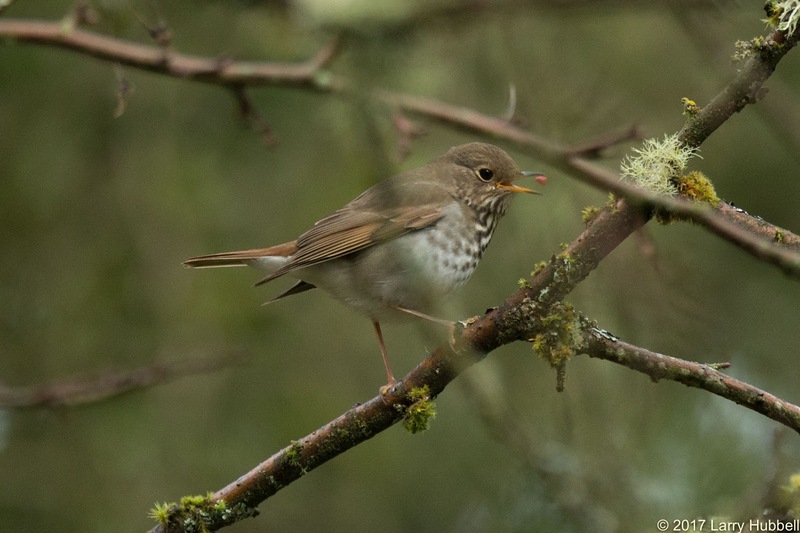 On the other hand their 'doppelgänger' - the Swainson's Thrush - tends to breed in our area and migrate far to the south during winter. In both species the upper side of the tail is reddish-brown. 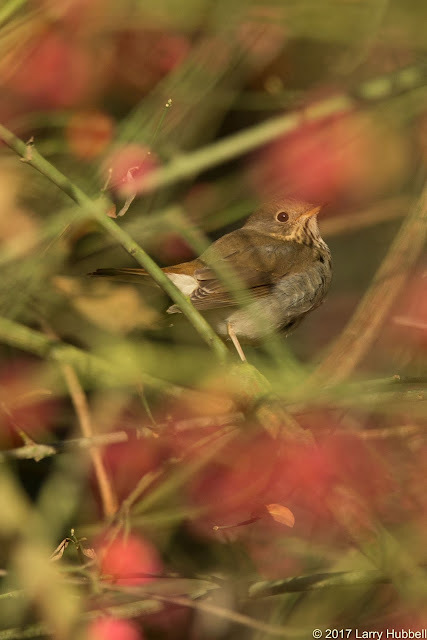 However, only on the Hermit Thrush does the back becomes a greysh-brown, without any hint of red. 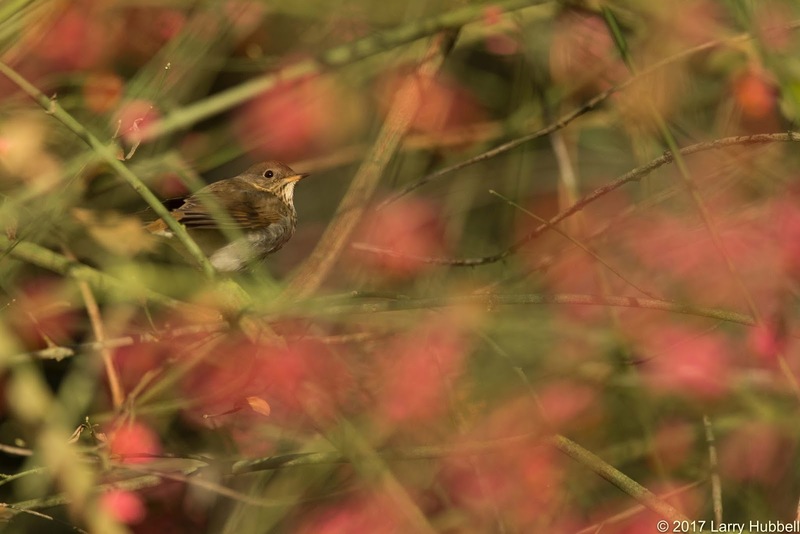 The Hermit Thrush also has a habit of flicking its tail up in the air, drooping its wings to each side and letting its tail slowly descend. I wonder if this is a mechanism for startling prey. I would think that fluttering its wings might be a more efficient method. Birds of North America (See citation below) provides another explanation for tail flicking. 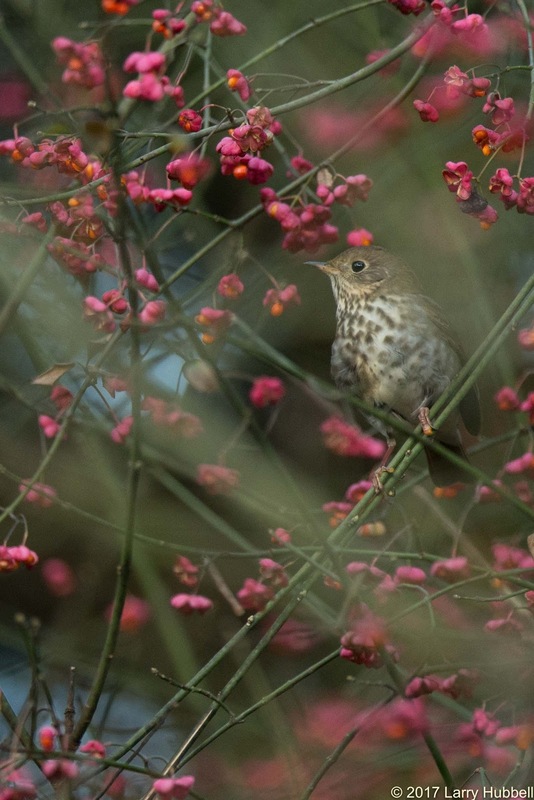 They imply that in a confrontation, between two Hermit Thrush, tail flicking may be a related to conflicting feelings. For example, if a bird is having difficulty choosing between fight or flight. ...but apparently harmless to birds. The Spindle Tree is named for its hardwood which was historically carved into spindles. 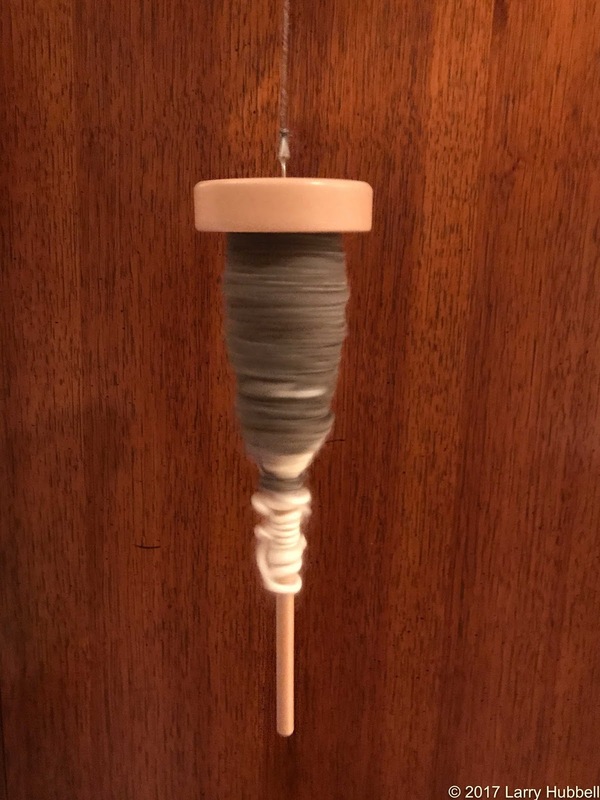 A spindle is an old-fashioned device for spinning wool into yarn. This process became more efficient with the invention of the spinning wheel. However, I am sure a spindle would have been much easier to carry - especially if you were a weaver who traveled with your flock. 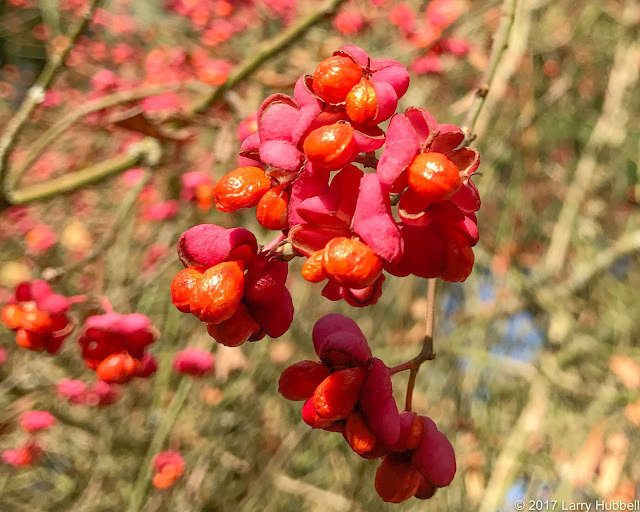 To learn more about the Spindle Tree, Click Here, and read this post from the University of Washington Botanic Gardens. If you take a Christmas walk through the Arboretum you may want to stop and search the Spindle Trees, who knows you may find a hermit hiding in the winter foliage. On Thursday I spotted this bird swooping over the water just south of Marsh Island, catching insects in mid-air. One of the things I noticed, while it was in-flight, was the tail seemed a bit shorter than I expected. What species of bird is it? 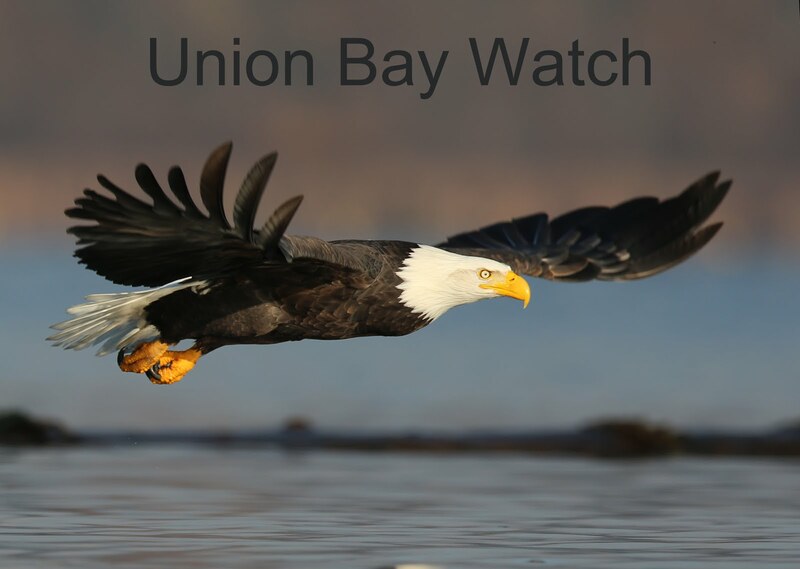 Is it a native to Union Bay? Can you guess its age? For bonus points is the Spindle Tree native to our area? 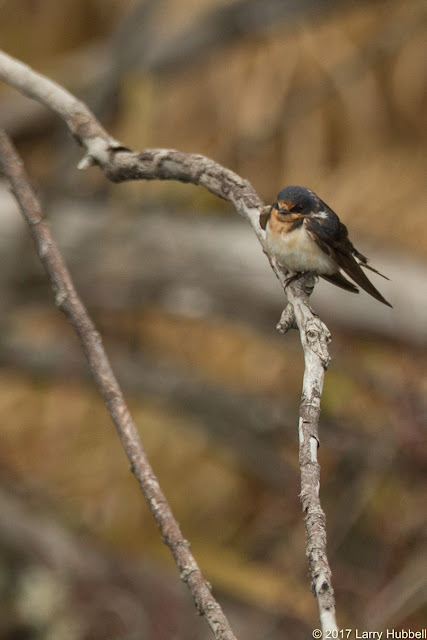 I believe this is a young, female Barn Swallow. 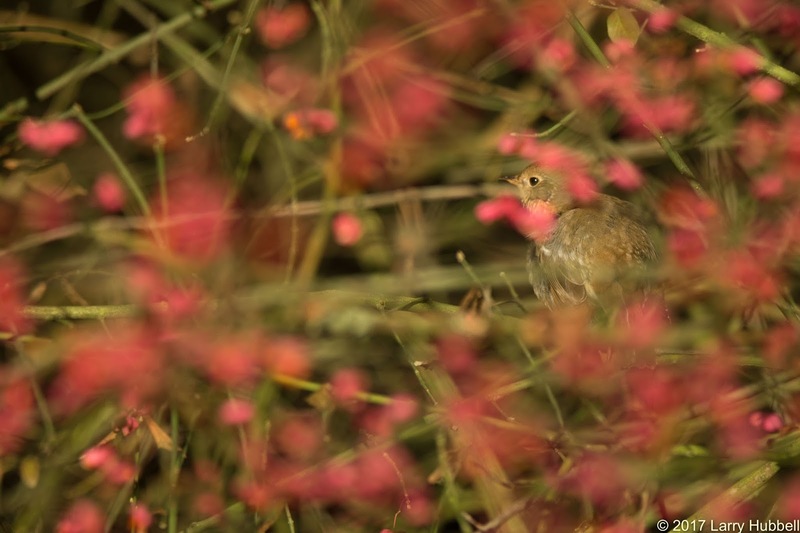 I am assuming female due to the mostly white breast and first-year bird due to the relatively short tail. It is native to Union Bay, but normally Barn Swallows are long gone at time of year. It should be somewhere in Central or South America by now. Hopefully, it catches a breeze which will move it at least a little further south. The Spindle Tree comes from the old world. Evidently, it was consider exceptionally useful and was apparently brought to North America hundreds of years ago. Beautiful images. 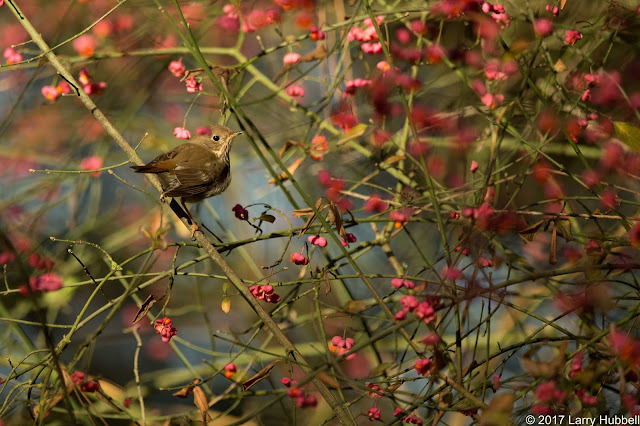 The colorful berries of the Spindle Tree really make these shots sing. I thought I wanted a Spindle tree for my yard, but now I don't. They got me at "poisonous to humans." It is interesting how other creatures can tolerate what we cannot. Happy Holidays!